To help improve performance of the agents many managers add a desktop solution. In many cases agent desktops are busy with 15 - 25 applications to assist them with their job duties. However, these applications do not help them with the timing of the contact center calls, emails and chats. This article is about desktops improving the timing of voice, email and chat with the customers and helping agents improve performance. There are many things that Managers want to see the agents improve on. Things such as ASA, Abandon rates, AHT, FCR%, CSat%, SvcLvl% and Accepted Calls are some of the top requested agent KPI’s. However, is it best to show some or all of these KPI’s? It depends on the agent. Every agent is different but there are top differences to consider. Call Center managers are challenged with many tasks but the top two, depending on the type of call center are: Reduce Costs or Increase Revenue. With these two goals the managers is always looking to minimize calls waiting to increase the possibility of sales or have a more effective agent that can manage multiple tasks. Considering these options the desktop wallboard will have specific type of content. The second issue that a Call Center Manager must overcome is dealing with agents that are significantly different from one another. The agent difference will determine the type and amount of content seen on the desktop wallboard. New agents need a minimum of data on the desktop but content that will help them do the job properly. 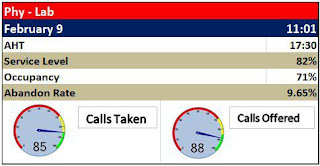 Here is an example of a desktop wallboard for a new agent. 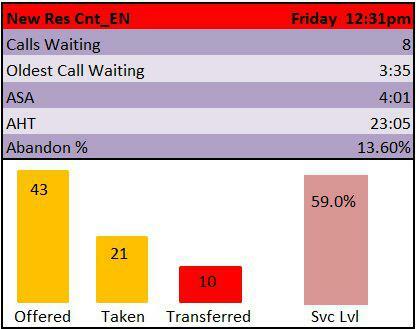 Key data is displayed that will help the new agent meet the immediate goals: answering the calls quickly. KPI’s on this desktop wallboard alert the experienced agent to goals that are not being achieved. These alerts will help adjust the agent’s performance. There are five things to think about prior to offering a desktop solution for the agents and deciding what each agent will see on their desktop. Topics to think about are: Agent Experience, Agent Attitude, Agent Responsibility, Group / Agent Goals and Corporate Goals. Agent Experience: A new agent versus a highly skilled experienced agent should see a desktop wallboard, but with different content considering their experience levels. Agent Attitude - Some agents have the wrong type of attitude in the call center. They do not like their job, their responsibilities, the manager or other agents, or they may not like incoming calls. If these agents cannot be trained or removed the content on the desktop may be goal oriented - such as CIQ, ASA, ABN, Oldest, Transferred, CSat and FCR. Agent Responsibility: The job the agent performs may affect the data they see on their desktop wallboard. A presales agent at a mutual fund company should be aware of the current wait time for callers. While an agent at an insurance company taking calls for policy cancellation may not need to know the current wait time. Group and Agent Goals can adjust the content requirements. A new sales order group/agent will need different content than an order cancellation group / agent. Corporate Goals - The goals, policies or procedures of the organization may set content rules for agent desktops. Assertive / aggressive organizations with trends to assist any caller may want desktop content to ensure calls are taken on time, not abandoned, and not transferred incorrectly, high FCR%, high CSat and much more. In these cases all agents should see this type of desktop content. Agent Attitude: Overly negative agents need desktop content that will help drive them to meet the goals that are provided to them. The proper content becomes the positive reminder for them to meet certain levels or risk poor annual reviews. Depending on the agent’s personality the KPI’s that are displayed on the agents desktop can change. For an agent that always reminds us of the annual goals it is best to use those goals as the KPI’s. 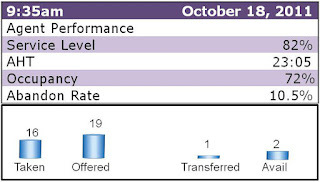 Managers should track the agent’s threshold analytics which can be used in the annual performance reviews. 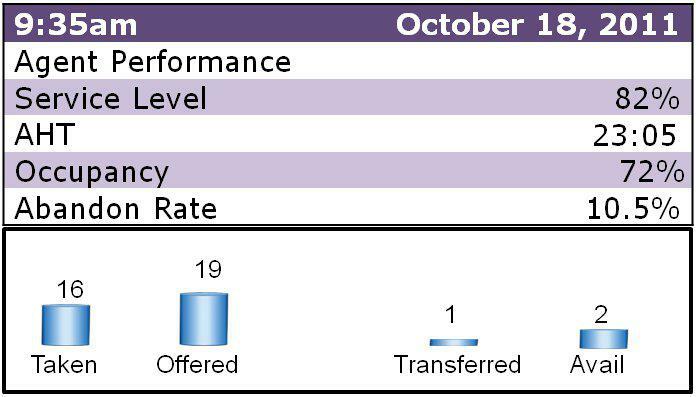 Additional KPI’s such as Calls Waiting, Oldest Wait Time and ASA might be added if they are a part of annual performance reviews. Agent Responsibility: Or another way to view this is the industry the call center group represents. New financial customer agents desire low answer times while product replacement agents do not mind keeping callers waiting. 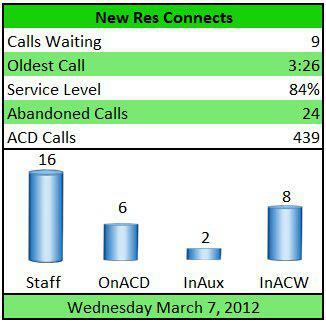 Help Desk agents are looking for high FCR and CSat numbers and wish to see this through the day. Consider what the goal is for the agent to determine what is on the desktop. A customer service or help desk should track and follow the metrics that show critical performance issues. Corporate Goals: The goals, trends, policies and procedures set down by the organization can affect the call center. As the corporation moves to meet the trends of their industry the changes may also affect the agents and how they are reviewed annually. Agents are made aware of organizational changes but need reminders on the desktop to help them meet the new goals and trends. Corporate changes directly affect the call center. Agents are notified of the changes and need relevant content that will help them achieve the new goals. The content mentioned and shown in the examples above are regarding agents and not team leaders, supervisors or managers. At times there is a request, by the agents, to change the content to show much of the same content the managers are seeing. The fault in this is some agents comparing themselves to others, agent comparing themselves to a group and invalid reasons to argue at the annual performance reviews. The idea of the desktop wallboard is to improve the agent’s performance and help them achieve or exceed their goals. Managers look at topics of interest to adjust their opinions of desktops and desktop content. As the industry changes there may be a need to change desktop content. 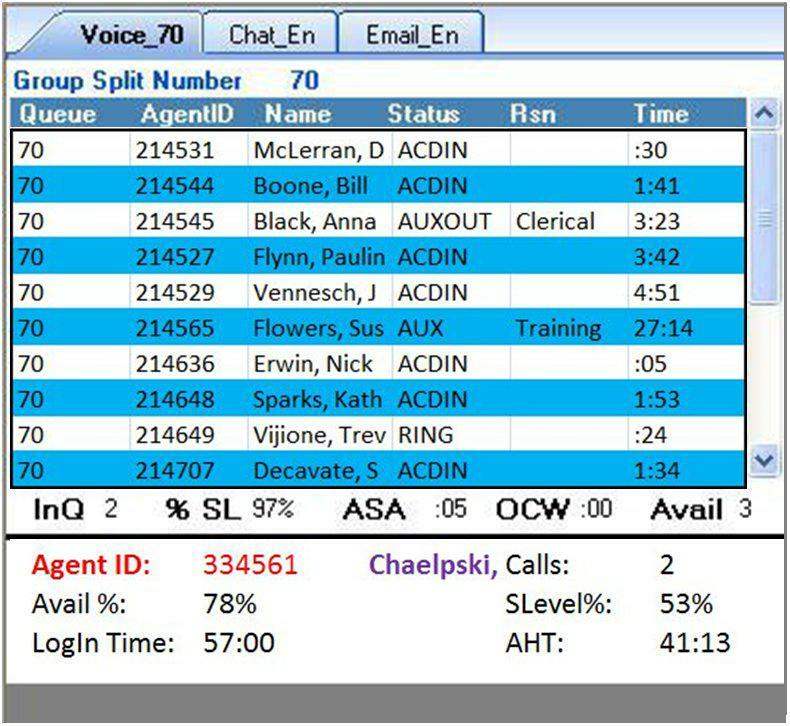 If the call center has trends that are not positive desktop reminders showing the lack of goal achievement may be displayed to the agents. Internal business alterations such as new products, improved communications or increased job responsibilities require more desktop information for the agents. During working hours the agent’s desktop is their domain manager’s use that thought process to help the agents improve or meet their goals. There are many other reasons for wanting a desktop wallboard for the agents. Stated below are some of the reasons given to Spectrum by current customers. Appropriate communication times with customers on email and chat. Desktop wallboards can help solve agent challenges if the goals are realistic, agents are trained, content is appropriate and content is altered as needed throughout the year. Desktops that are all the same for all agents, leaders and managers will not improve the performance for a long period of time. Threshold analytics which provides details on performance beyond what the agent is viewing. Team leader content from Voice, Chat and email. Agent status, reason codes and the time they have been in that status. Group content and then critical KPI information at the bottom of the desktop display. 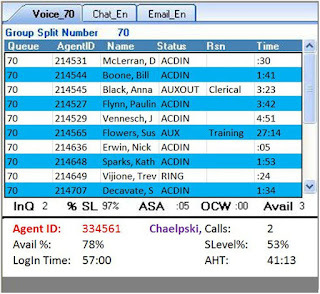 Content covering calls, email and chat will show the manager details about the incoming customer contacts and how the groups are performing. Select group, agent details and analytics in a dashboard for a manager help with daily, weekly, monthly or annual status. A group analytics review shows the overall performance on meeting the goals. These analytics can alert a manager to trends the agents think they can hide. The Hit Count shows how many times a threshold has been exceeded, how long it has affected the queue in Duration and the KPI Name. Agent Desktop wallboards can be very effective in helping the agents meet their goals by displaying appropriate content to the agent. When adjusted based on the agent’s personality the managers can continue to assist the agents meet their annual performance goals. Keeping the same old content on the desktop while the agent improves or changes their role causes the agent to hide or ignore the desktop wallboard. Spectrum is a leading provider of Unified Contact Center Reporting. Contact Spectrum today to learn more about Agent Desktop Wallboards.